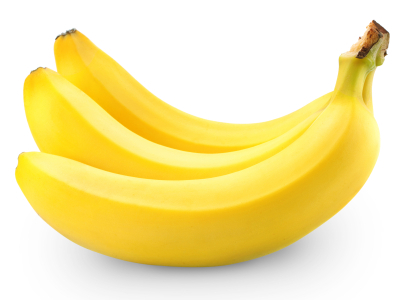 A Salute to the Second Bananas in the Workplace! So much focus is put on leadership, we run the risk of overlooking the incredibly wide range of talents in everyone — just waiting to be developed more. People who strive for a leadership position are held in higher esteem than those who do not. A second-class message lingers about employees who do not strive to move up the ladder — despite their vast talents and contributions. We can replace this misguided culture with one that values all the talents of the entire team. The benefits to the organization and employees abound. Retention of high performing team members and their knowledge and finely honed teamwork. An abundance mentality rather than a fight for the leadership spots. A flourishing collaboration as people experience true recognition rather than a skew toward those who strive for the title of leader. This is the zone of true employee engagement. It highlights contributions not just as tests for future leadership slots but also as a celebration of everyone’s talents and contributions. People can grow and excel at what they do well rather than feign interest in a leadership position to avoid being seen as an underachiever. In addition to occupational skills and business knowledge, people have natural talents and people skills abilities that deliver success to the organization. A great collaborator. Those who have natural collaboration skills or have developed them through years of work are a definite asset to any team. A memory bank. Even the greatest computers don’t replace someone with a memory for BOTH what has transpired AND the human impact and reaction to it. This memory bank becomes the team’s intuition and collective gut for in-the-moment decisions. A motivator. Those who inspire themselves and others to higher levels bring every organization to un-imagined success. A velvet truth teller. These naturals at speaking the truth honestly not brutally deliver the soft strength of trust to an organization and its pursuits. A creative. Having a creative on a team whose function is not primarily creative expands the team’s capacity to work on non-standard requests and its ability to work with creative departments. An innovator. Those who love and deliver innovation fuel evolution and prevent the failure that comes from inertia and resistance to change. A supporter. Supporters naturally anticipate needs, fill gaps, and often excel at last minute problem solving. Valuable for any team. An empathizer. Teamwork needs more than occupational skills to succeed. It needs people with emotional intelligence who can sustain each other. An empathizer does this easily and well and helps all to rise above tough times to reach the goal. A sounding board. This ability to know exactly when to listen and when to question while allowing others to own their progression uplifts all who experience this gift. A get-it-done guy/gal. Without action, ideas die. The follow-through champs drive home success. A healthy skeptic. Skeptics abound and often drown progress. Healthy skeptics challenge assumptions and prevent groupthink to keep progress flowing. A critical thinker. Often tapped for a leadership position yet not always interested or successful as a leader. Their value to any team is undisputed. A port in a storm. Those who can keep the calm for themselves and others during unexpected chaos keep the team balanced and performing during the blasts. A practical philosopher. Philosophical insights can sustain morale, move all beyond obstacles, and even solve problems. When applied with a simultaneous eye for the practical, the practical philosopher sees solutions that others overlook. A balance beam. Employees that see both sides of every issue, easily give and take, have hope yet still understand despair, love the present and adapt to the future, become the solid base of success for the whole team. A sprinter. Bursts of winning energy help every team handle sudden changes and requests, jump the hurdles, and win the day. A marathoner. Picture a grueling project that is not a sprint. Marathoners are an endless pump of energy, hope, and action during the long haul. A billboard of diversity. An employee who is of mixed culture, has lived in different countries, grew up with parents of different generations, etc… can bring a valuable renaissance of open-mindedness to the organization and resulting success. A nexus of personality types. Personality type differences can often be the source of discord. People who border the different personality types (and yes they do exist), help smooth the rough edges and blend the diversity into success. A double cookie. This is a phrase I coined for people who have great capacity to use their left and right brains together. Instead of being heavily left brain or tipping over to the creative right side, double cookies deliver the power of creative analysis and the big picture. They can spot when the team is trapped on either side or in a war between the two. They spotlight the juncture for team success. An intuitive. Historically, workplace cultures have marginalized the value of intuition. That is slowly changing to embrace intuitives’ gift of the gut to speed team success. An organizer. The natural organizer clears the path of complexity for all to reach simple success. A transplant. The employee who has worked in many industries, or professions, or departments in the organization delivers the single greatest advantage to reducing silos. Let us not label them as unreliable. Let us benefit from their broad vision. A rainmaker. This rare ability to create opportunities and attract new customers is not just for sales departments. A rainmaker fuels cross teamwork. A rainmaker can energize any team to the highest level of spirited performance. A communicator. Great communication was, is, and will be the essential fuel and necessary glue of any organization. Celebrate those who do it well and let them be the model for the organization. What must leaders do to salute these talents and the employees who have them? Overcome the historical myth that those who don’t want to climb the ladders are lazy. Global success does not proceed vertically. Companies must reach outward not just upward. Organizations who “get this”, retain the talent. Change compensation schemes that claim there must be some who outperform others and base bonuses on that scheme. When you retain tremendous talent who are feeding success, make sure you give them all the fruits of their labor. Change compensation schemes that automatically pay more if someone switches into a management/leadership position. This has been discussed for years as the dual track issue and some organizations have made great strides. Give testimonials on high performers to other departments. Employees who don’t want to climb the ladder may want to broaden their experience by working in other areas of the organization. When a leader praises their talents to other department leaders, that leader is saluting the employee’s talent. The leader is fueling the employee’s career success and the organization’s as well. From your unique perspective, what would you add to the list of 25 to make it a list of 50 valuable talents to honor and celebrate? I welcome your contribution in the comments field below. Leaders, Do You Really Know Why Your Employees Work? 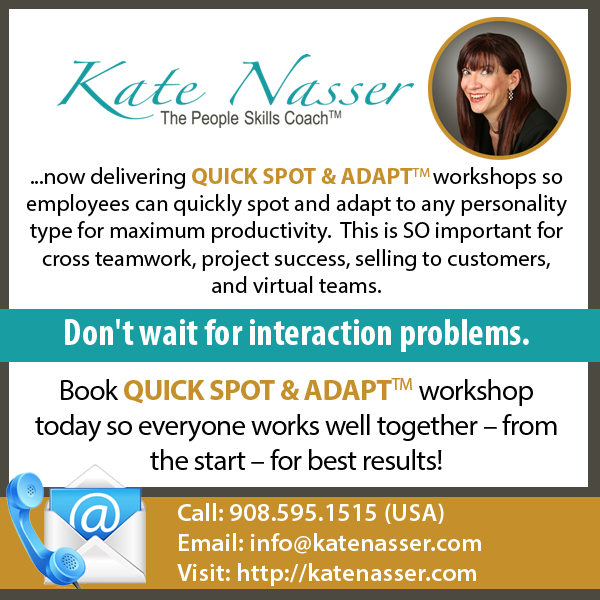 ©2012-2015 Kate Nasser, CAS, Inc. Somerville, NJ. I appreciate your sharing the link to this post on your social streams. However, if you want to re-post or republish the content of this post, please email info@katenasser.com for permission and guidelines. Thank you for respecting intellectual capital. Engage in people skills learning! Let’s turn interaction obstacles into business success in leadership, teamwork, and customer service experience. I invite your questions, welcome your wisdom, and look forward to working with you. I have to salute you for such creativity you show in your posts. You touch base a very long outstanding issue and it is very valid point when you said management has to change their mindset that employee has to jump as a leader to be appreciated. I’m faced with this challenge in introducing a new bonus scheme in our company. Performance will be awarded to people based on agreed objectives early in the year. But the problem comes when you want to reward outstanding performers when you have to choose among all in the division! There is a hope in introducing a technical ladder which might solve some of the issues but you are describing something that looks as a perfect fit for such rewarding scheme! I hope more objective rewarding as you explained is applied in my company one day. It is definitely a challenge Khalid — especially in highly technical organizations. Please let me know what I can do to assist you (beyond this blog post) for IT orgs. are my specialty! Many thanks for adding your story here for all to learn. Kate, thanks for a great list. My first two thoughts are: 1) Leaders can be these things too; and 2) Wow, 25 positions to fill! We would all do well to appreciate those other strengths and roles on the team. They’re all valuable. Thanks for the great list! I completely agree that leaders can be these things too. In fact, the leaders who have most or all of these things shine not only in results but in the hearts of their team members. And many thanks Mike for your comment. Your http://leadchangegroup.com blog is a tremendous help to all. It seems as though you and a couple of other bloggers have been reading my heart/mind here lately with all the great content! And that’s not to say that I would NEVER take the helm IF/WHEN a calling arises within my heart and that’s where I’m supposed to go/do/be. I naturally like to HELP within organizations. Not sure if this is because that is where I feel most comfortable due to occupations and positions I’ve held. Although I’ve even had leadership positions within organizations. Yet, that isn’t the big motivator for me. I LOVE helping other leaders/people. And it in no way personally detracts from my own perception of myself as a leader. If that makes sense. Just because I may not be the head honcho doesn’t mean I’m NOT a ‘leader’. I may simply enjoy the harmonizing and play of strength between people, etc. My last ‘boss’ even told me I make a great ‘intrapreneur’. Not sure if that is because I have less experience as an entrepreneur or if it just comes naturally. I loved your list of 25 things. 19 and 20 stood out to me as I just answered one of Lolly’s questions and shared how technically, I’m an INFP. Yet every personality test I’ve taken, I score close to the border in all 4 quadrants. I’ve also taken a brain test that helped determine whether or not you are more right-brained or left brained. Although I’m SLIGHTLY more right-brained, once again, the results revealed that I use both hemispheres of my brain almost equally. So pleased to have your personal story added to this discussion Samantha. When you know yourself you gift everyone with that insight — your work, your family, your friends, and of course yourself. And I love to meet double cookies! I hope you will always share your perspective on any post of interest here at Smart SenseAbilities(tm). Brilliant Kate! There still are far too many organizations in which there is an up or out (thinking of the big 4 accounting firms) or an up or “sidelined” mentality. And all to often up means you must manage people whether you have desire or capability to do so because there is no compensation track for people who have higly valued technical skills or knowledge. I think ultimately to make this shift in mindset, we have to shift our mindset from valuing a job on an org chart to valuing the promises we make and deliver. I can really relate to what Samantha said – I too am a “double cookie” falling slightly more left brained and on the border in two of the Meier’s Briggs categories. Growing into making a bigger difference and impact always motivated me more than position when I worked in corporations. Perhaps that’s why eventually I chose to leave and prefer solopreneurship and collaboration on projects with diverse colleagues. The nature of jobs is changing and with “free agency” fast becoming a norm, ultimately it could actually allow better for truly valuing the diversity of players needed to succeed. Thanks Susan. And it’s nice to meet another “double cookie”! This is a fabulous list! I personally love #4: a velvet truth teller! I pride myself in trying to uphold this as often as possible. I think this is something missing from today’s culture/society. Might I add “A Community Spokesperson or Company Advocate.” Someone who is able to informally serve as a representative of the company in the community is a valuable asset. They help create awareness of the company, its culture and its news by being involved in activities outside of the normal sphere of work. Might I add, in case it isn’t crystal clear, that being a leader of oneself is equally as important as being a leader of others! I do agree with you that leading oneself is equally important. Exactly what motivated me to write this post. A person’s career is their individual responsibility. Figure out what the talents you have that naturally play to a company’s success and market yourself to parlay that into long term career success. Many thanks for your add on this! A great list. If “leadership” is taken out of the context of formal organizational position and authority, it actually means so much more. It becomes more versatile, individual, appreciative, and inclusive. Bravo for seeing people and their unique contributions as the gold, rather than a job role per se. To me, the best leadership happens in moments, and any of us are eligible to rise into them based on exactly the kinds of traits you’ve described. And it is a tragedy when those moments are overshadowed by a “leader” who must be the center of attention. Best to you! I love this list Kate! What you propose would be the ideal list of qualities needed to make a great team / company. What makes this list work is that the different strengths do not overlap in ways that will crush any one person’s point of view, wherein reality, they complement each other. Nice! I, too, look forward to the day when a job interviewee can say, “I am a velvet truth teller.” This is a great phrase! Companies and leaders that appreciate this are the ones who embrace innovation, outside-the-box thinking and promote the brainstorming so necessary to move a company forward. In my world, I call the second banana “the lieutenant.” This is the person who really is the right arm of the person in charge and a role that is not for the weak of heart. Frankly, I see this role as vital and one that I have seen many people assume with gusto. One other term I use often (especially in regards to leadership) is The Safety Net. This is the person who allows ideas to flow naturally by offering encouragement and does not admonish with the imminent threat of retribution should the idea fail. Hmmm… Cyndy. The Safety Net — very interesting idea. Free to see any idea through? I think it could be used very successfully during the “noodling” stage and even into the assessment. How often do leaders let it go through to completion? Kate, I liken the safety net to this. Picture being in a classroom of kids who are letting their imaginations run wild and being creative without inhibition. How often that is allowed to happen probably depends on the industry, culture, and comfort level of the leadership in exploring the unknown or untapped. I’ll make a bold statement and say, it probably doesn’t happen enough. However, good leaders do need to possess some of those qualities mentioned.